About 2 1/2 years ago an early 30 something guy appeared at my door. He had a maturity and confidence that only come with life experience. He told me that he had heard that we were developing a new digital media center and wanted to know more about it. I was (and still am) happy to talk about one of the most exciting technology/creativity projects that the university has ever undertaken. It has turned into the Integrated Media Center, also known as GullWorks studios. This man had a great story. He left college about 10 years earlier and had spent the time learning to become an audio engineer, musician, performer, roady, a husband, a father, and who knows what else. With passion and a coolness he told me his story. He then asked how he could become involved in what we were doing. I told him that this was all new territory. The idea was to build state of the art digital studios where students interested in film making, broadcast, music recording, digital photography, new media and music could collaborate and create. This is still a bit of a work in progress, but the progress and enthusiasm of the students has made it an exciting ride. Jesse, the hero of this story, decided that in his early 30's he wanted to become a part of it. He wanted to come back to school and get his degree. He wanted to broaden his skills to include film, digital photography, new media and other areas. 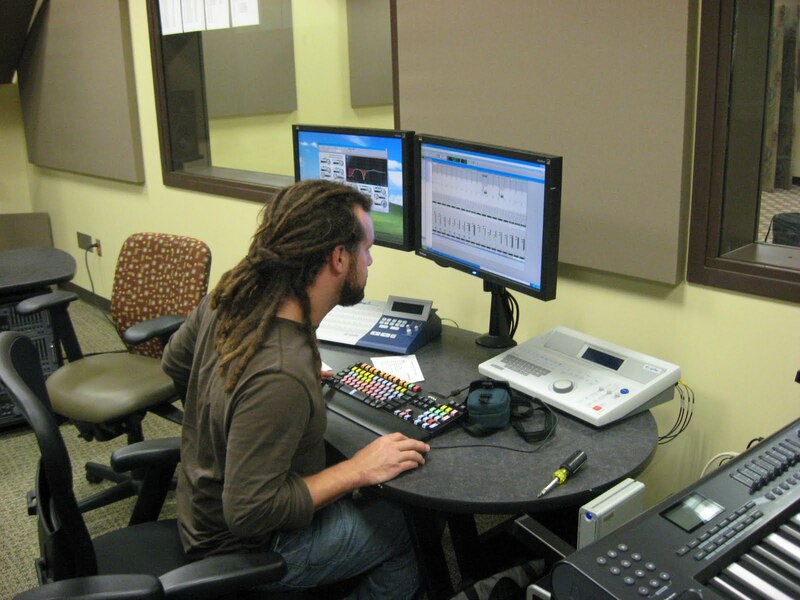 He was also willing to help us open the recording studio and develop an open recording opportunity for student musicians from across the campus. Jesse could not land on a major, with so many interests, so he created his own in Interdisciplinary Studies. He held many roles as a student, mentor to younger students, audio engineer and tutor. Old enough to be a professor, but stuck in the "tween" role with many titles. By the way, during his 2 1/2 year journey he added another little girl to his young family. It was really fun watching Jesse discover new passions as he took each creative course. His passion just keeps growing and is evident in the quality of the work he produces. One such work landed the subject on the Oprah Winfrey show, you can see it on YouTube at this link. Jesse, Jesse Campbell, is a heroic character. He graduates in December 2010 at 30 something. He over came personal challenges, exemplified the art of deferred gratification, worked very hard, and with the support of his wife and family made his dream come true. He made his mark at Salisbury and had a positive impact on many young students. A really great success story. Congratulations Jesse. Great story. This should be published in the Daily Times and run as a local interest story on the news. It is wonderful to see a teacher take the time to pay tribute to a student in this manner! I know how much these words meant!